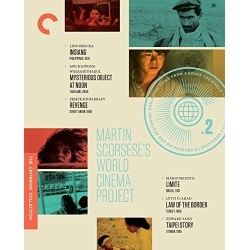 Established by Martin Scorsese in 2007, the Film Foundations World Cinema Project has maintained a passionate commitment to preserving and presenting masterpieces from around the globe, with a growing roster of more than two dozen restorations that have introduced moviegoers to often-overlooked areas of cinema history. This collectors set gathers six important works, from the Philippines (Insiang), Thailand (Mysterious Object at Noon), Soviet Kazakhstan (Revenge), Brazil (Limite), Turkey (Law of the Border), and Taiwan (Taipei Story). Each title is an essential contribution to the art form and a window onto a filmmaking tradition that international audiences previously had limited opportunities to experience.